Closing the entrance to the mine, we showed AMPHIS how much iron ore we had managed to collect so far, and the diamond we had found in the chamber close to the shelter. He was impressed! We had only been working on it for a few days, and yet all of our mineshafts had yielded unprecedented quantities of iron ore! Better yet, whilst AMPHIS was working on decoding and translating the books, we were going to thoroughly explore the chamber system, and retrieve as much iron as possible. We descended into my mineshaft, right to the bottom, where we then led AMPHIS past the lava flow, which he also found to be beautiful yet dangerous, through the chamber, and to the shelter. "This is what we've found so far, and the hidden passage is located beyond this wall, by flicking that lever. I would start with the book that Syeonyx found on the table, and see what you can make of that. We're leaving the bag of food and equipment here with you, whilst we go and mine for more iron." "Fair enough... Are you sure that no-one lives here anymore...?" "No we're not sure, but if they are, and they come back, you can always use the blowpipe OROTHO provided you with. We'll be back every few hours to rest and check on your progress. Depending on the situation, we may go back to base, or stay here for the night. It's likely we'll stay here though as it's easier than constantly moving around on the surface. Safer too..."
AMPHIS settled into the chair, and we set off back towards the mineshafts. I had left my pickaxe near the mossy cobblestone chamber, and UOPETA and THEROS had left theirs in their respective mineshafts. After we retrieved them, we went back down my mineshaft, and began to explore the area, extracting iron ore wherever we found it! 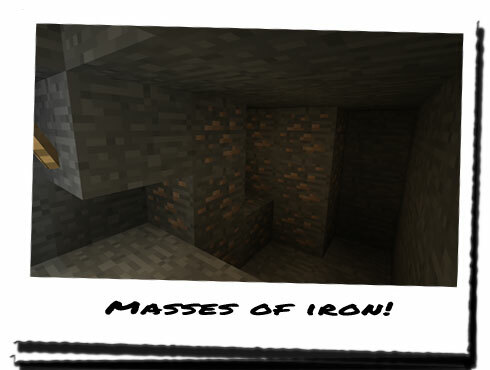 We had been mining for some time, and we had managed to extract vast quantities of iron; probably more than if we had worked independently in three separate mineshafts! We had explored a decent portion of the tunnels too, finding more lava flows which seemed to stem from the first we had encountered. We had also found masses of coal, which we have left for the time being, and quite a bit of redstone and gold. OROTHO needed the gold for electrical components, and the redstone can easily be used as wiring for everything, provided it is contained within a rubber or plastic tubing... I'll let OROTHO and COLUS worry about that though. We would mine a small amount, take it back up to storage, and then return, by which time, another one of us would be making our way up to store more iron ore, redstone or gold. Essentially we always had one person mining and one person delivering more ore to the storage area. It was a surprisingly simple and efficient system for three of us, and after a few hours, and a lot of aching muscles later, we went back to the wooden shelter, turning in for the day, and to check on AMPHIS. He had surely had adequate time to decipher what this new book spoke of, provided he had decoded the first layer with the cipher, and then translated. Hopefully there weren't going to be any wild assumptions this time, and a more or less straight forward translation. "What do you think the chances are of this shelter being linked to that Finis book we found a few days ago?" "Judging from everything that's happened recently, I'd say it was impossible for it not to be connected... The chamber, the book, the wooden shelter, the books encoded with the pig-pen cipher and the hidden tunnel... It's not a matter of whether it's connected, it's a matter of who it's connected to, and as an extension, is HoN Co. involved..."
I still couldn't push aside the thoughts that suggested HoN Co. were involved to some degree... It made little sense, especially if what AMPHIS had translated originally was true... Maybe Finis suggested that when the master portal was activated, instead of merging two dimensions, like HoN Co. think, it will instead open a gateway to The End... Hopefully we'll find some information about The End in this shelter. Rounding the corner of the chamber, and seeing the wooden door still shut, we knew little had changed, so it was highly unlikely that whoever had lived here had returned. On the inside, however, things had changed quite a bit! AMPHIS was now sitting on the floor rather than at the table, and was surrounded by books from the shelves! Some of the bookshelves were now totally bare, and AMPHIS seemed quite at home, in a see of paper and ink, furiously writing down on pieces of spare paper. Seeing us enter, he looked a little afraid to begin with; maybe he thought we were the owners of this place coming back, but once he saw who it was, a smile sprang onto his face. "Ah, you're back! Good, I think I've made progress!" We entered into the centre of the room, and I opted to sit on the floor; my legs and arms were killing me, and I couldn't stand a moment longer! AMPHIS stood up, joining THEROS and UOPETA, and began to inform us of the progress he had made. "That book you found, Finis. I believe that wasn't meant to be finished... You recall that I found a few pages missing? Well, I think I know why they were ripped out..."
"Oh, good! Do you know where they could be...?" "That's irrelevant. What I've found out suggests that the pages torn from the book were wrong. They were a mistake!" "Well, when you rip pages from a book, it's either to hide something, or because it's wrong... If they were trying to hide it, they would have left it in this room. It's harder to find than a chamber like the one you found it in. Additionally, the book I looked at first seems to be a re-write of it!" "Yes. It has no title, but the symbols, and the translations are almost word for word perfect as Finis! Up to a point that is. My guess is, whoever wrote Finis was unhappy with the last few pages they had written, torn them out and disposed of them, and then decided to start from scratch... It could be an OCD thing... But this book would suggest whoever wrote it was unhappy with the first draft..."
"OCD...? Obsessive Compulsive Disorder...? You're saying the missing pages were torn out because they didn't like what they wrote...?" "No, I don't think so. I believe the missing pages are a result of this person finding out their information was wrong, ripped the pages out, and then started from scratch. Some people are like that. SERVERE was like that as well to an extent. And OROTHO. A single mistake and they start again. It's a wonder I managed to write up any of the reports OROTHO wrote, with the number of times he kept starting from scratch!" "Right, well that's irrelevant. What else does the book say? What does the extra bit tell us?" "Actually, it links the book to the passage you found. The last bits seem to indicate that this person is trying to find something, maybe a portal. They began the passage, stating they had good reason to believe what they were looking for was close by." "Really? How did they know that?" "I honestly don't know. They mention some form of evidence in another book they wrote some time ago, and I've been trying to find it for some time..."
"Well it's best if you have some rest. It's late, and we've all tomorrow to find even more information..."